Saturday, March 29, 2015: Up to clear sunny skies and warming temperatures. It has been a great couple of days at Grand Canyon National Park but it is time to move on. 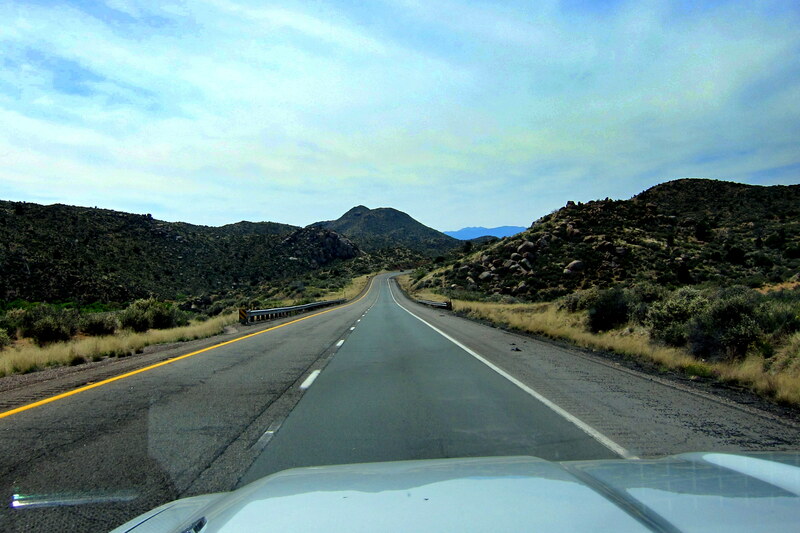 By 1030 Kit and I wind our way through the park, depart by the south entrance and take AZ-64 toward Williams, Arizona. Within the hour we intersect I-40 and head west. Huh…..west?!?! Shouldn’t Kit and I be heading home about now, and if so, isn’t this the wrong way? Yes we should, and yes it is! Nearing the town of Kingman, we start looking for a place to get fuel. With this truck needing diesel, and with the extra height of the new fifth wheel trailer, finding an accommodating service station is a bit more problematic. 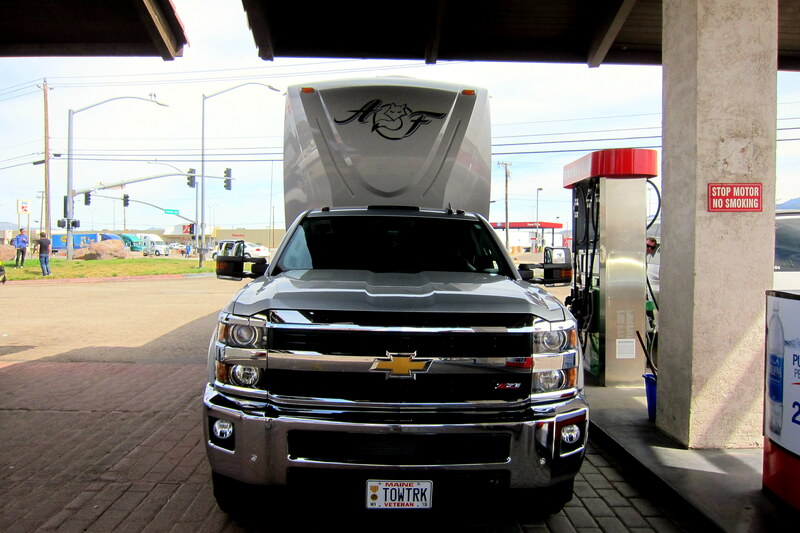 Generally we use truck stops and preferably the RV friendly Flying J chain. Fortunately the GPS showed a Flying J just ahead…..unfortunately it was jam packed. Fortunately, there was an RV lane with only one motorhome getting fuel……unfortunately, he also needed to dump his tanks, take on fresh water, and have his propane tank refilled, an evolution that would take about a half an hour. Fortunately, I noticed a gas station across the way that had diesel……unfortunately, the canopy over the pump had a low clearance. Fortunately, I was able to barely squeeze in and fill my tank. Unfortunately, I then needed to back out into traffic. Fortunately, my spotter was able to safely guide me. All’s well that ends well! From Kingman, Arizona we hopped on US-93 and headed north and Kit noticed that the wildflowers were in full bloom along the roadside. Around mid-afternoon, we stopped for a break at a wide spot in the road on the desolate highway. Kit made up some sandwiches which we enjoyed in the camper. 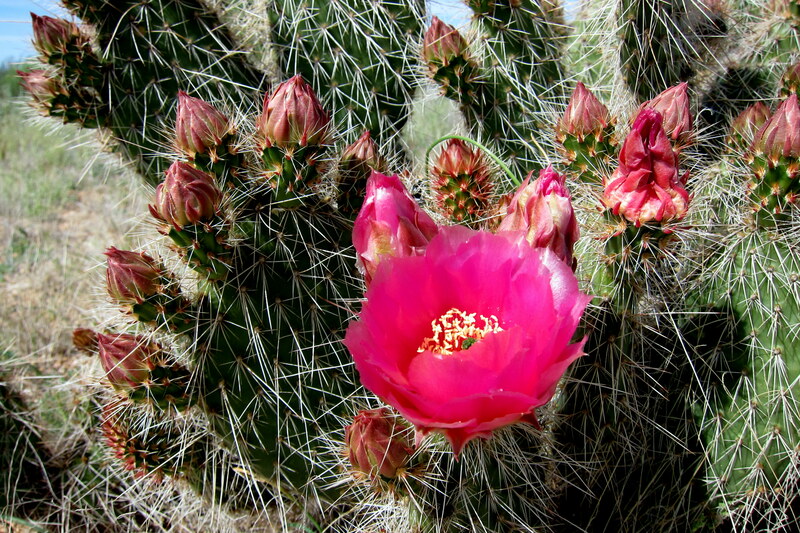 Afterward, we took a walk about to stretch our legs and noticed a number of cacti blooming about the desert floor. A half hour later we were back on the road. About 1600, we crossed the Colorado River by way of the Pat Tillman Bridge and entered the state of Nevada, and the Pacific Time Zone. As Kit and I rolled through Boulder City we decided there was still time to drop by the kid’s home in South Las Vegas for a surprise visit. Kevin, Suzie, Jack and Tucker knew we were inbound…..however didn’t expect us until tomorrow. So parking the rig on a side street, we walked up and rang the doorbell. Had a nice reunion and everyone trooped out to see the new camper. 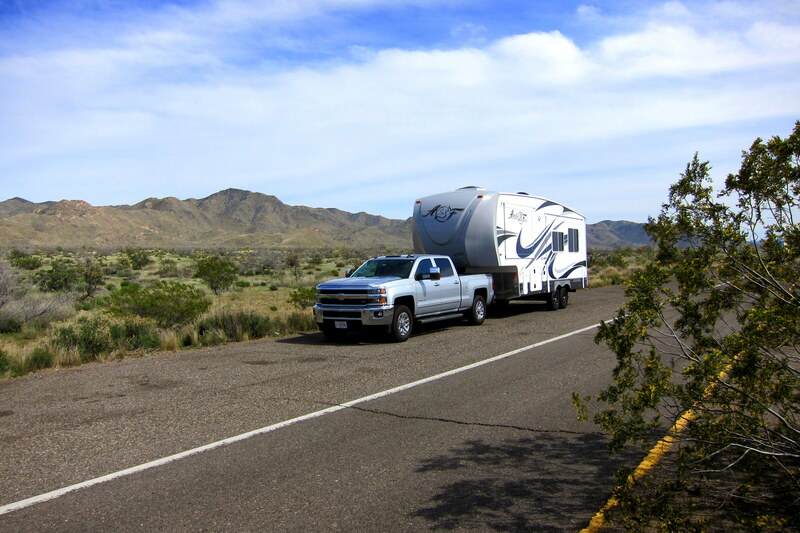 We only stayed an hour before finding our way to Nellis AFB and Desert Eagle RV Park. 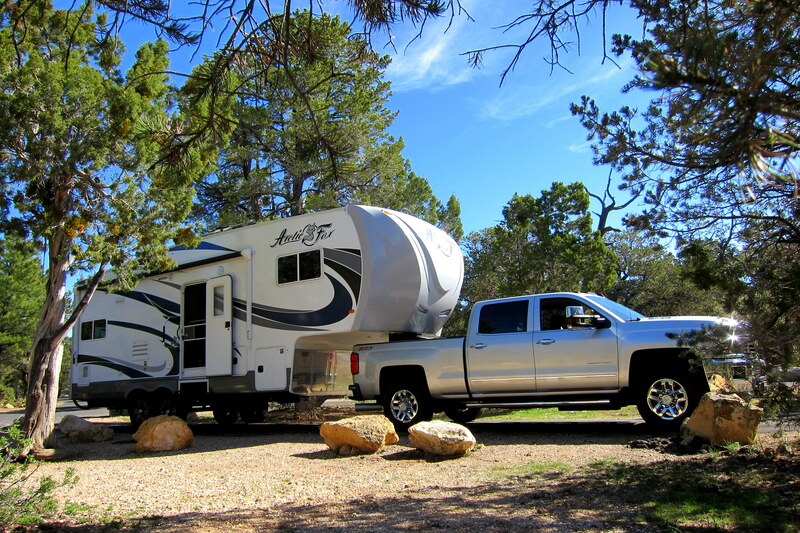 We kept the truck tethered to the camper as we move to an RV resort in the morning that is closer to the family and has more kid friendly amenities. After a nice meal and a few laps around the campground Kit and I settled in for the night. 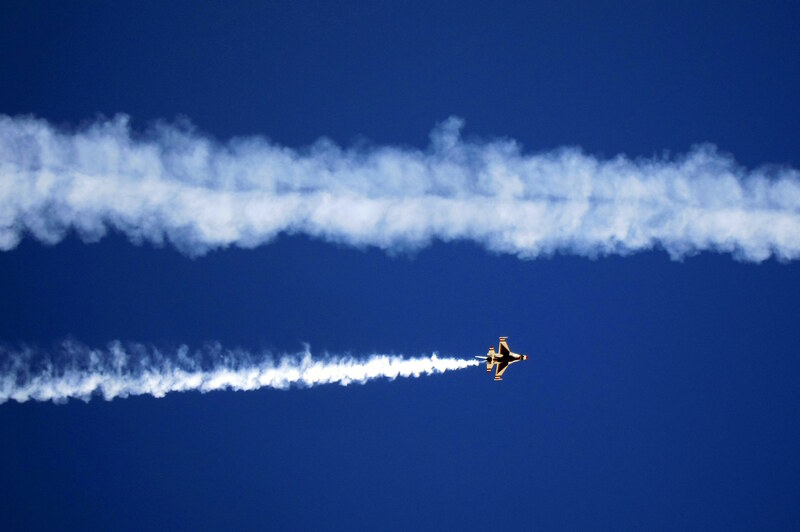 Sunday, March 30, 2015: This morning, we were treated to an aerial demonstration by the USAF Thunderbirds…..right over the campground. 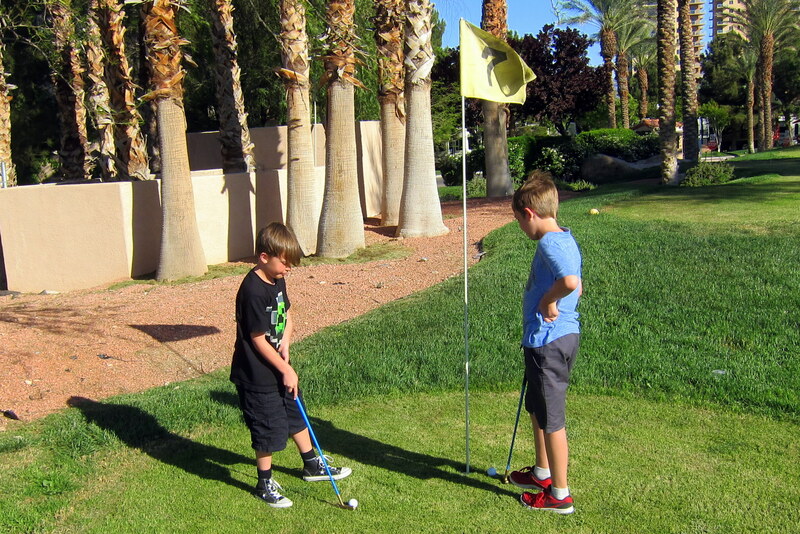 Later, we would learn that this is the beginning of their show season and they would be absent from their home base for the rest of the time we were in Las Vegas. 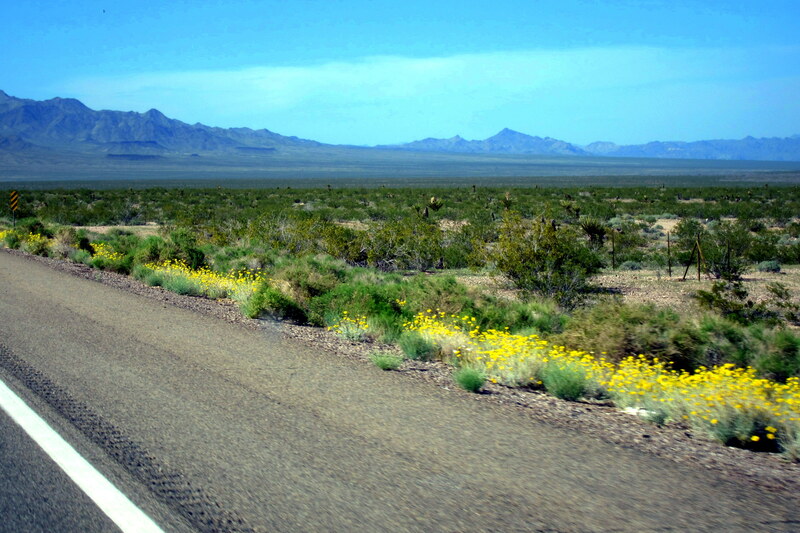 Monday, March 30th through Sunday, April 5th 2015-Oasis RV Park, Las Vegas, Nevada: Up and on the road mid-morning for the 20 mile trip to Oasis RV Resort, a place we have stayed a number of times in the past. Our two youngest grand’s are starting their week long spring break from school so Kit and I look forward to having them with us for an extended stay…..and their parents look forward to escaping to enjoy a cruise down the Mexican Coast! 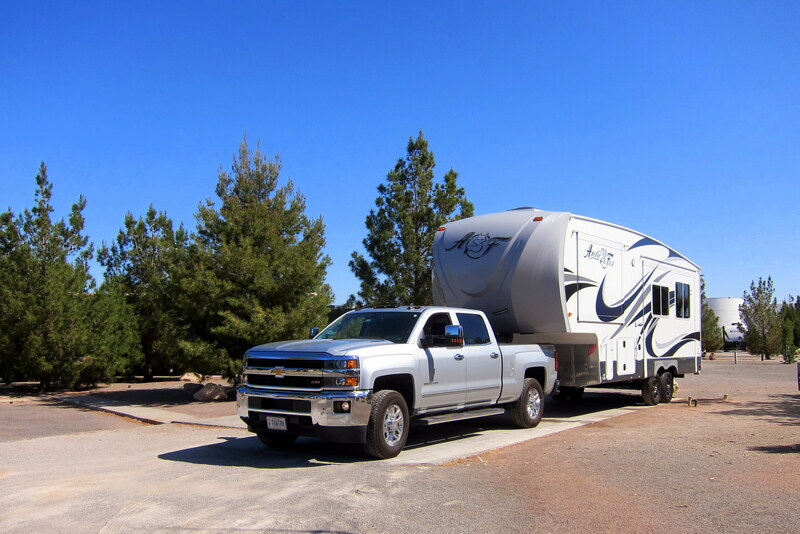 The RV Park is a bit more crowded this time through but there are still many nice spots available. We choose a pull-through site near by the pool and recreation area. 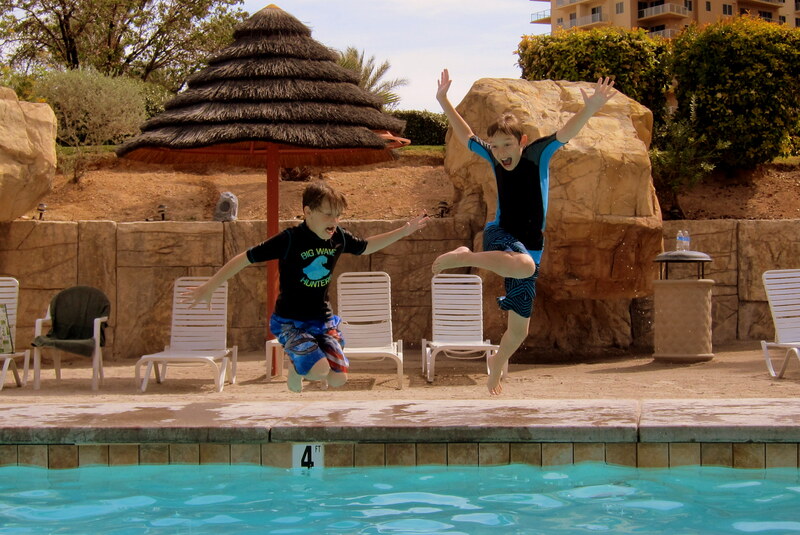 Speaking of pools, there are two…..and the kids took advantage of them daily! 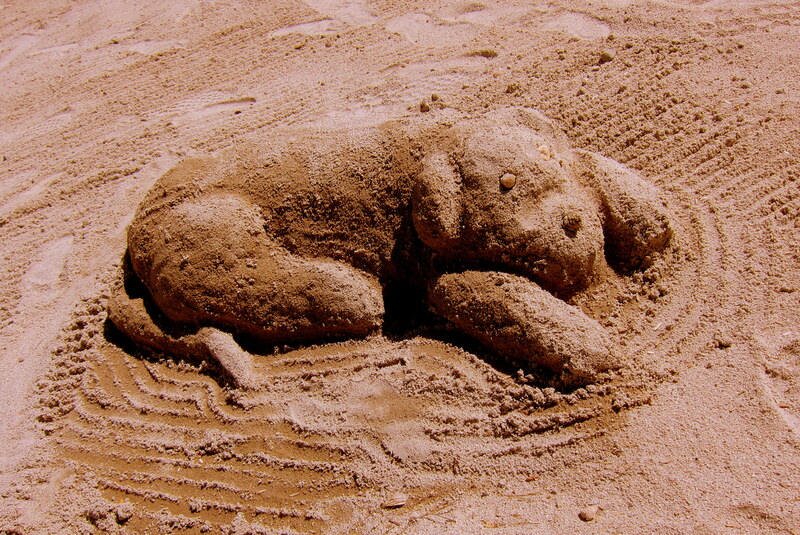 While lounging about the pool, I discovered a poor dog that looked to be abandoned. I thought about giving him a forever home and naming him Sandy. However Kit and I decided that our life is too nomadic and unpredictable to care for a pet. Also within the park is a small 18-hole golf course that received a fair amount of abuse from us. 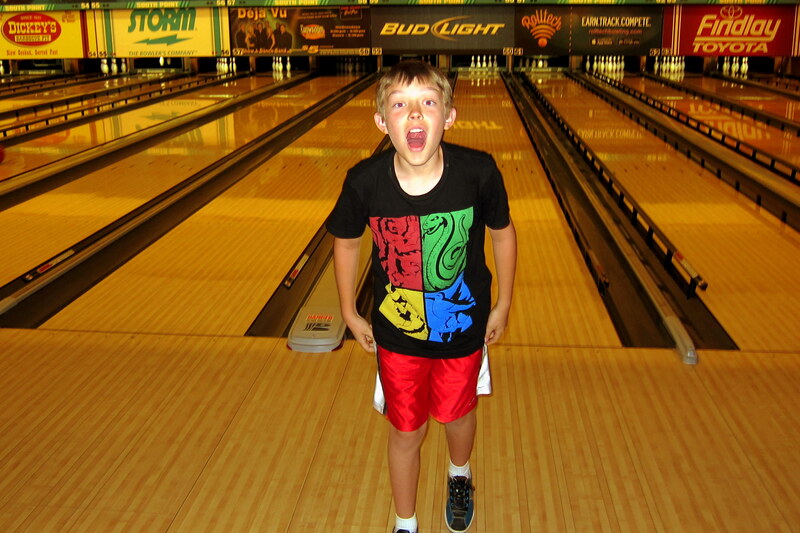 In addition, we spent time at the South Point Casino participating in the sport of bowling…..at times with great skill and success. And, at times not so much. We also did a fair amount of shopping in various toy stores. 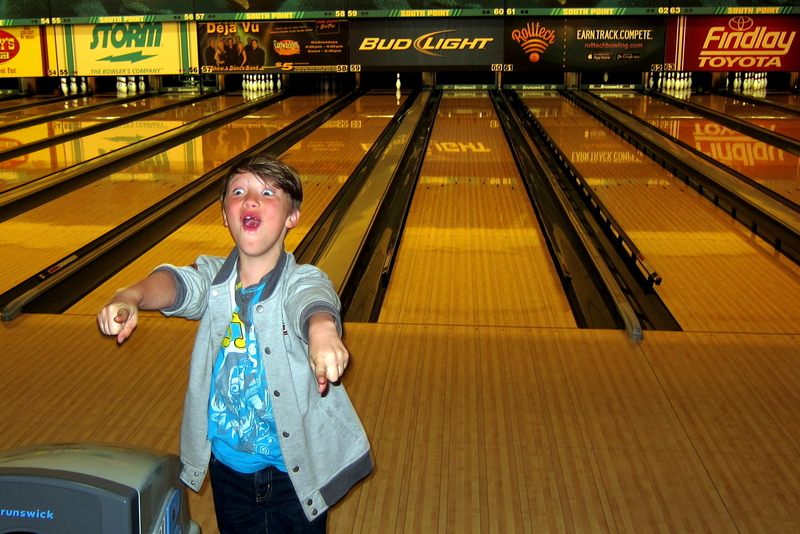 You know how some youngsters like to go on those storefront amusement rides…..not our boys! 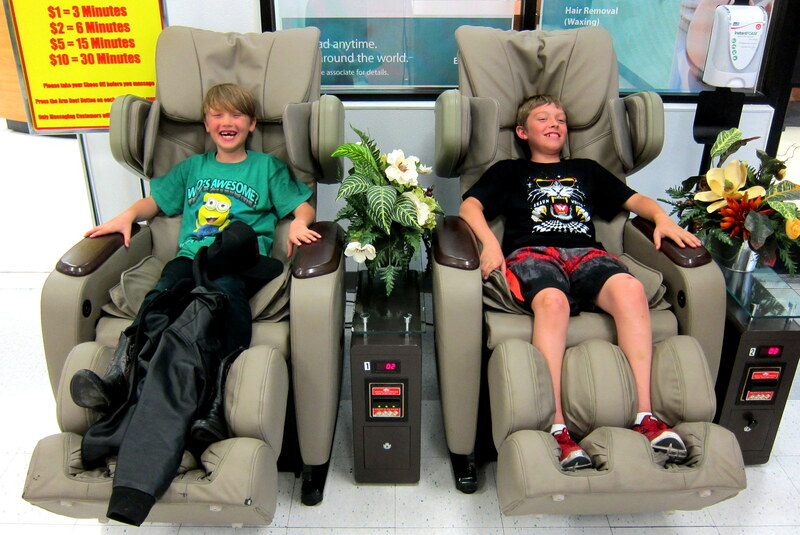 They love the coin operated massage chairs, over and over again! 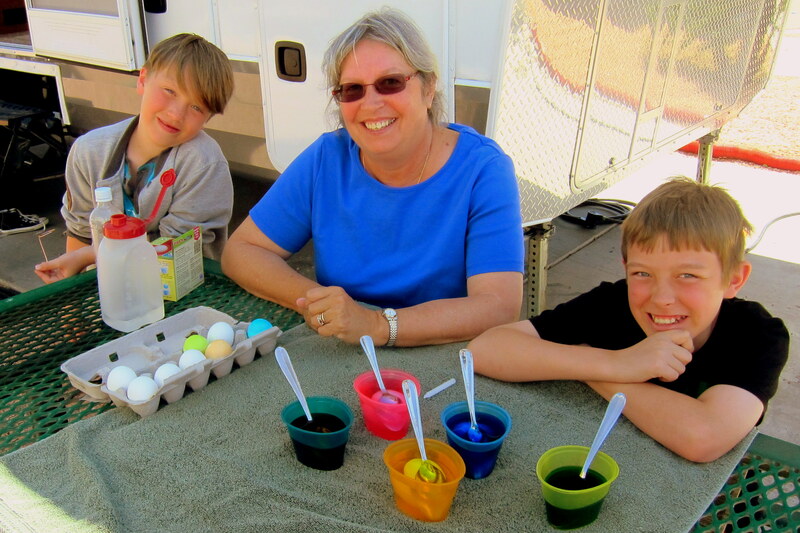 Since we spent the Easter holiday with the grand’s during this stay, Kit spent time helping them with the traditional coloring of the eggs…..an outdoor activity for sure! Even with their parents out of town, somehow the Easter bunny made it to their home in the wee hours of the morning. Then when we stopped in later to feed the dogs, the kiddles had an Easter surprise! 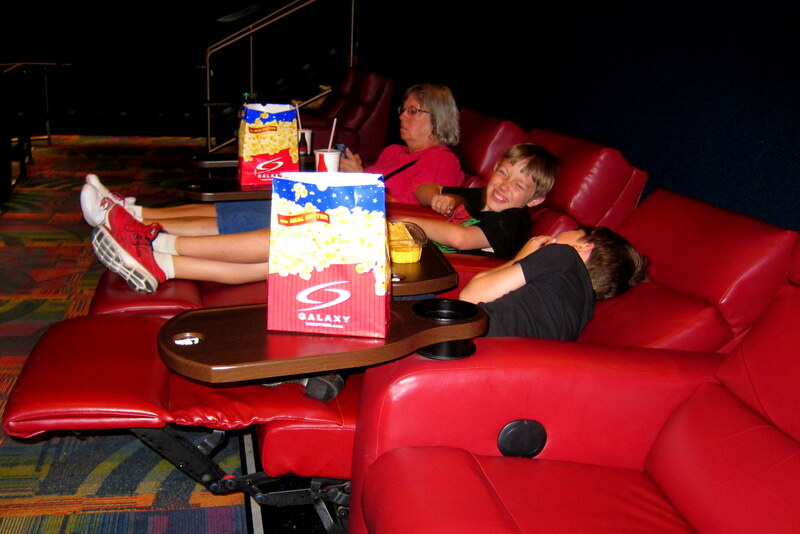 Once each visit, we like to take the Jack and Tucker to a movie at their all-time favorite theater. The Galaxy Deluxe Plus features comfortable reclining seats and state of the art projection equipment. 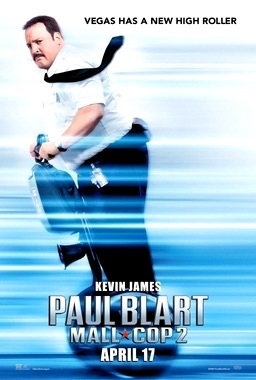 Their choice for the film this stop was Paul Blart: Mall Cop2. The boys loved the film. Kit and I thought that it was so inane and void of any entertainment value that it was actually hilarious in a campy sort of way. 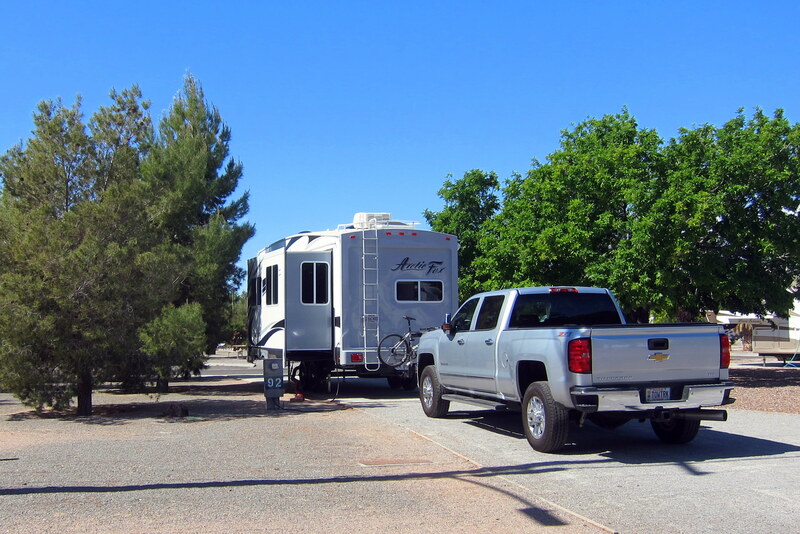 Monday, April 6th 2015: With the kiddles back in school, we relocated the camper back to Desert Eagle RV Park on Nellis AFB. This is actually a campground more our style and a whole lot less expensive. It is a half hour drive to where Suzie, Kevin, Jack and Tucker live…..however with the parents at work and the kids in school, we usually end up seeing them only on the weekends anyway. 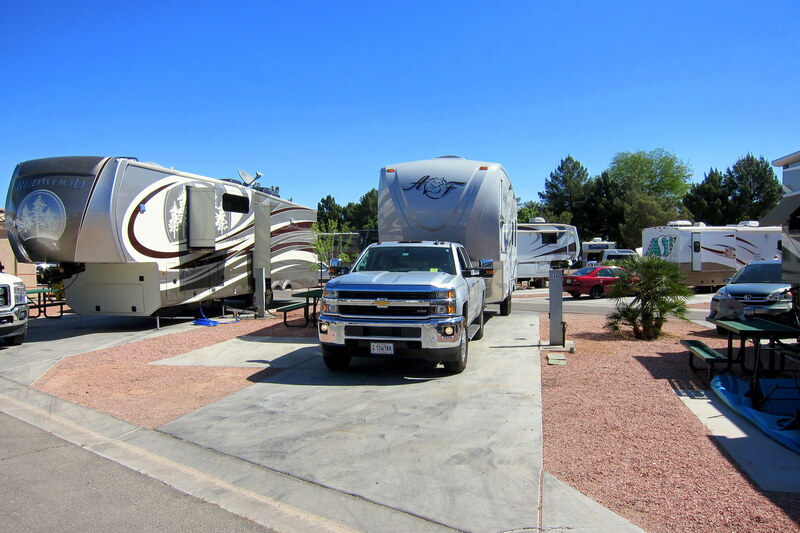 Tuesday, April 7th through Monday, April 28 2015-Desert Eagle RV Park, Nellis AFB, Las Vegas, Nevada: For the three weeks we were here, Kit and I took advantage of the lull in our hectic travel to attend to a number of items. There was a six week follow-up on Kit’s eye issue, and I’m happy to report that everything appears normal……well, except we still don’t see eye-to-eye on most things, but that too is normal! 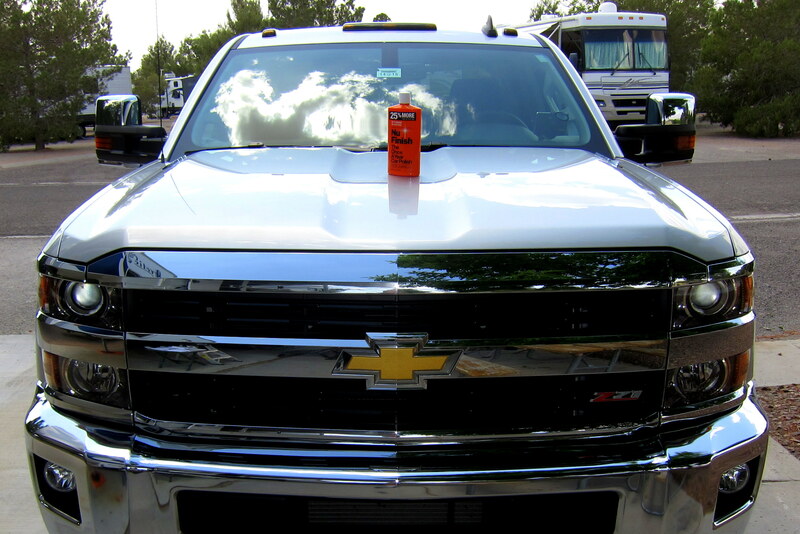 I was able to take care of some truck and trailer maintenance and even spent a day giving the truck its first complete waxing. One of the highlights during this time was reconnecting with an old friend and his family. Allen and I worked together on the Navy’s shipbuilding program in Maine for many years and have stayed in touch since my retirement. He currently is a Radar System Engineer and travels all over the world in support of the US Navy’s Aegis Combat System program. 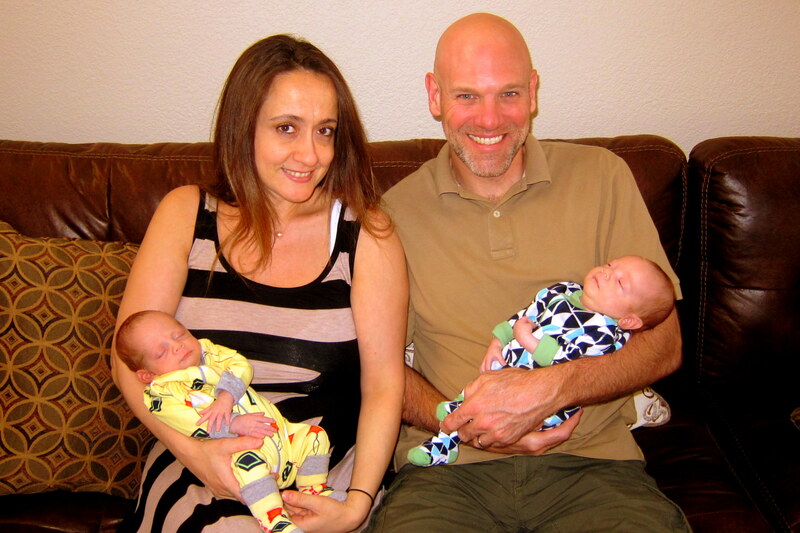 Allen and his wife, Claudine are the proud parents of six week old twins, Adam and Andrew! 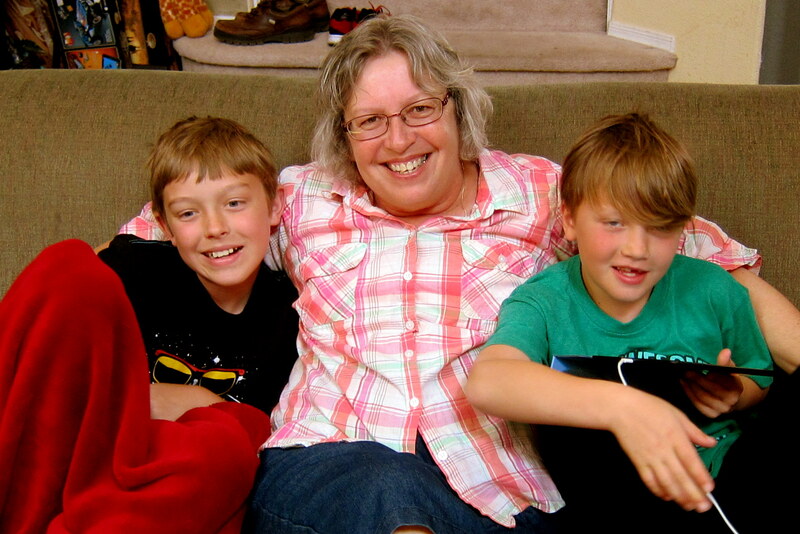 Kit was in heaven around those little ones…..it just happened to be her birthday and, according to her, holding those boys was the best birthday gift ever! I even got in the act! 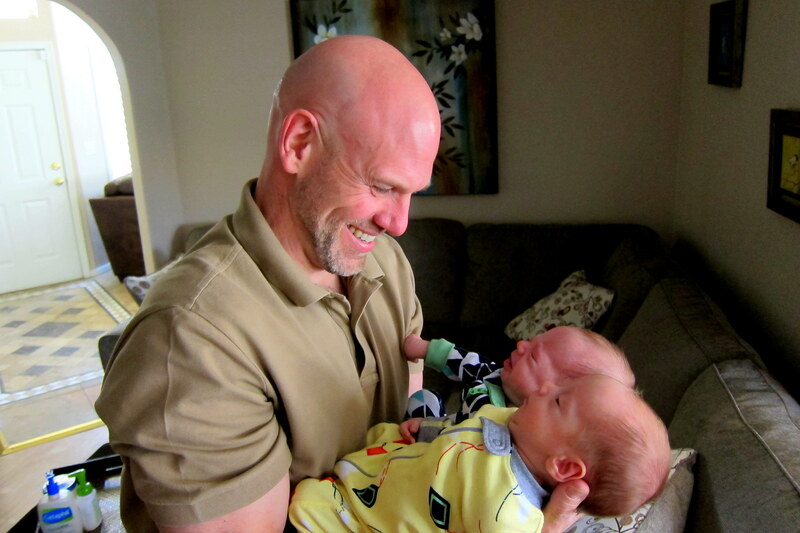 It’s been many years since I had the joy of holding a new young life! Allen and Claudine put on an incredible lunch for us, and we had a blast visiting and enjoying their hospitality…..Thanks folks! 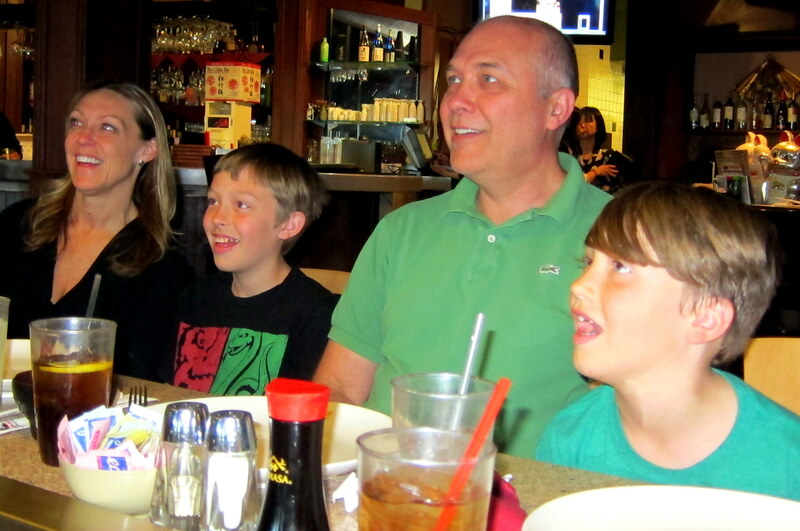 A few days later we spent the day at various shopping areas and enjoyed a nice meal out. Since Kit and my birthdays are only 5 days apart, we traditionally celebrate them together by going out to dinner. This year we went to a local tavern…..BJ’s Brewhouse. 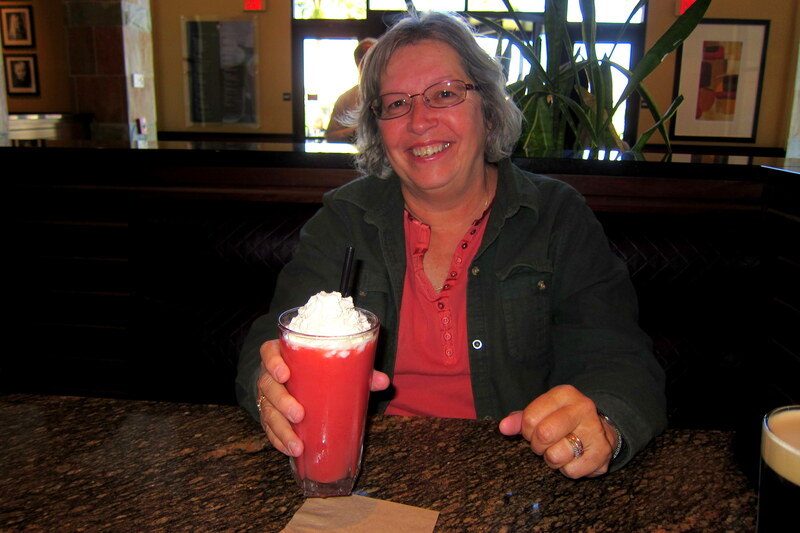 I had one of their signature microbrews, and Kit enjoyed a Strawberry Daiquiri. 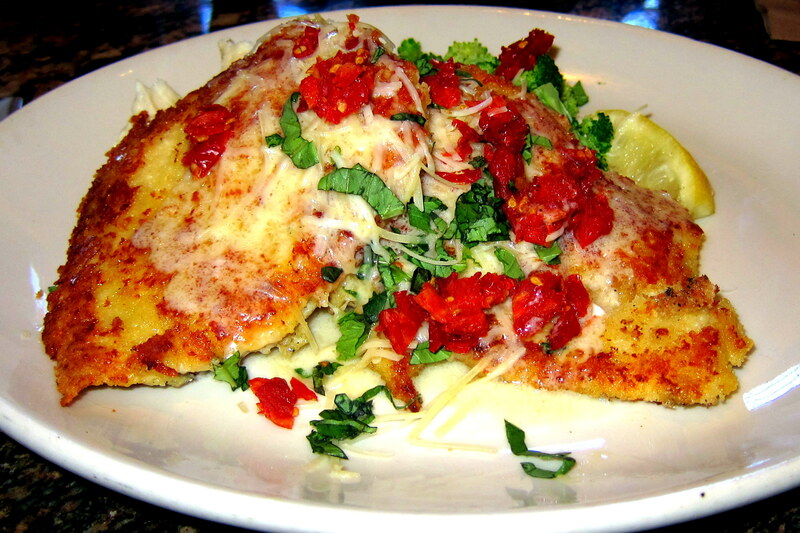 We both ordered the waiters recommendation of Parmesan Crusted Chicken. The meal, as well as the day, was incredible! 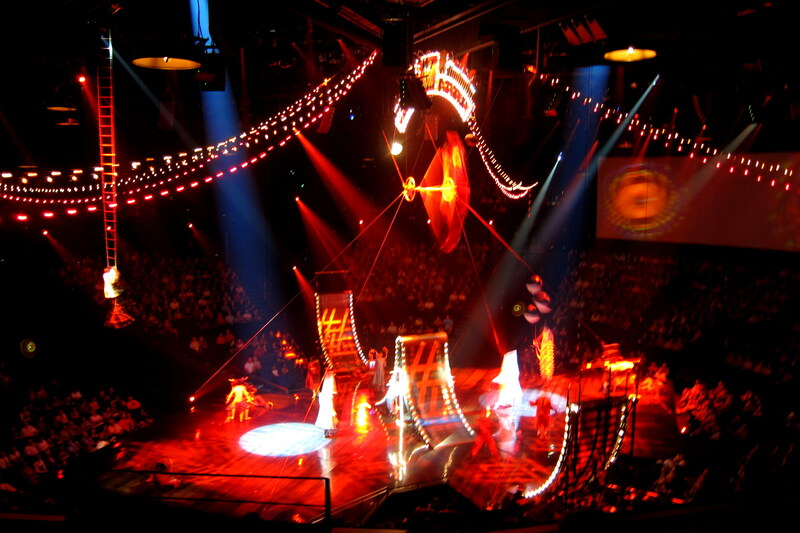 On another day, our son-in-law was able to get us tickets to the Cirque du Solei show Love, which is in its 10th season at the Mirage. This is the second time we have enjoyed this great show. 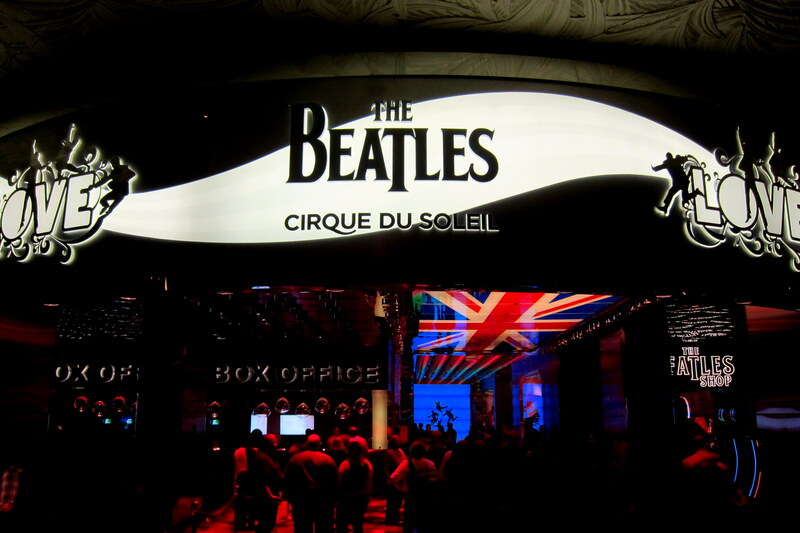 The Beatles music mastered from the original Abby Road recordings combined with a high octane acrobatic performance is one of the best Cirque shows ever! As a bonus, and for the first time during all the live productions we have enjoyed over the years, the management allowed flash-less photography during the show. As you can see, the specially built theater is in the round. The 2,013 seats feature three speakers each, including a pair in the headrest, for an incredible audio and visual experience! Amped up after the spectacular show, Kit and I wandered about enjoying the nice warm evening and not wanting the day to come to a close. The month of April is heavy with family birthdays. In addition to Kit and mine, our youngest daughter celebrated her 29th (and holding) and our youngest grandchild celebrated his 8th (and accelerating) birthday. Our extended stay this year allowed us to participate in Suzie’s at one of her favorite eating establishments and Tucker’s by tagging along as he pretty much called the shots. His day started with a visit to New York New York for some fun in the arcade and an attempt to ride the famous roller coaster…..unfortunately he was just a few inches short of the height restriction. 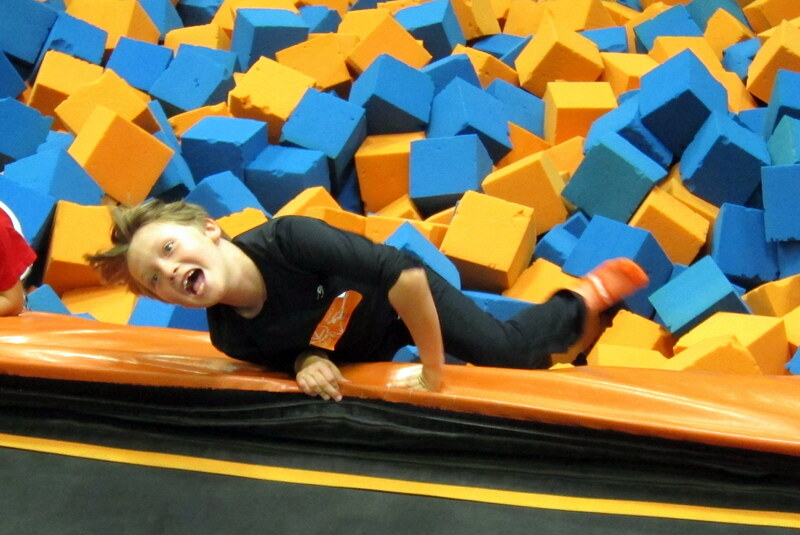 Tucker then lead us all to the Fly Zone, a multi-facetted indoor play complex consistently primarily of trampolines and jump pits. 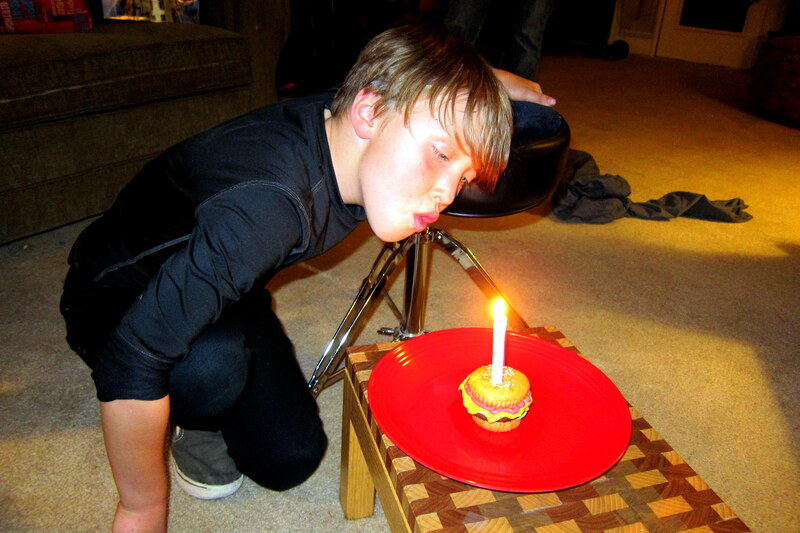 Then, following a birthday meal at Steak and Shake, we returned to his home for presents and cake. 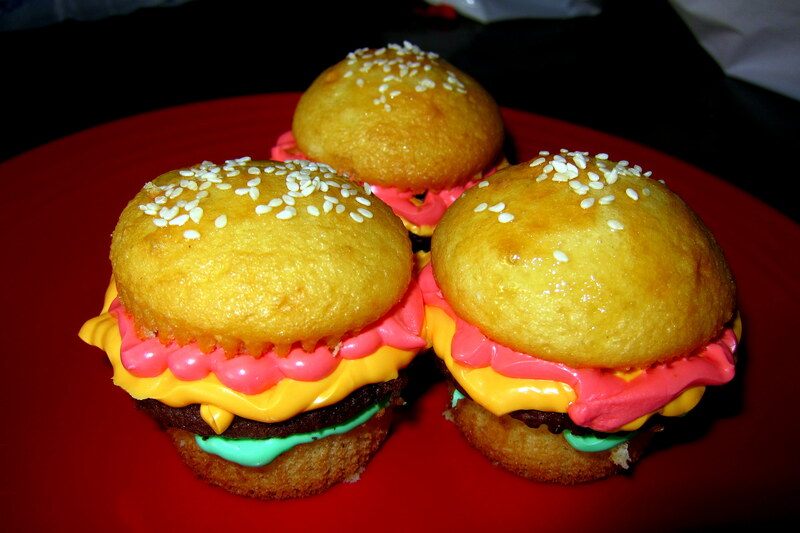 Or, in this case, hamburger themed cupcakes artfully created by his mom. It was nice to be in town for everyone’s birthday! 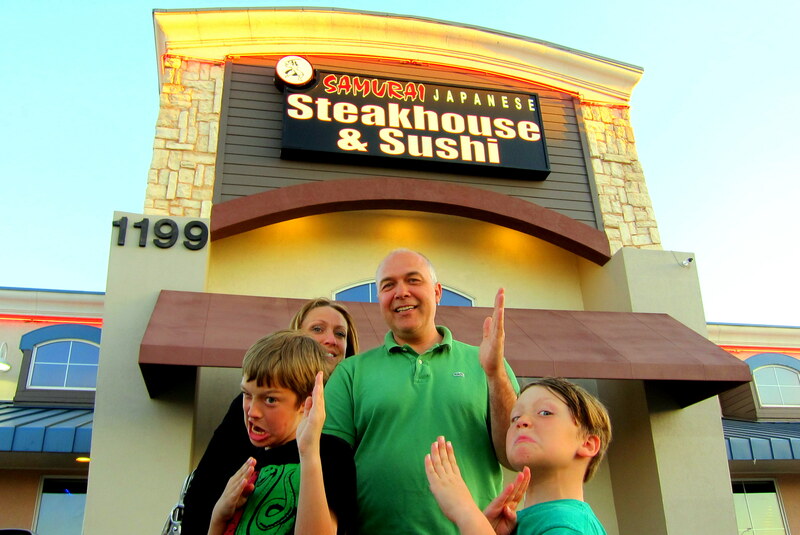 Another family dining opportunity we participated in was a trip to the Samurai Steakhouse. The tableside grill work was outstanding and the antics of the chef kept us all entertained. The boys came in for particular attention by the chef and we had a blast watching their reaction of flying food and big fire from the grill. Well, this ends chapter #1 of our extended stay in Las Vegas…..please look for chapter #2 arriving soon at an Inbox near you. 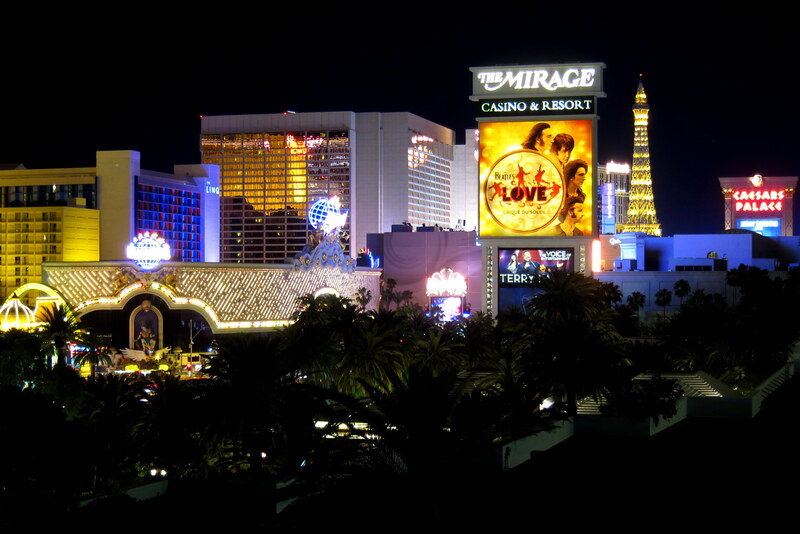 Kit’s Bit’s: We’re having a very enjoyable stay in Las Vegas this time. With this very hectic “life style” we have these days, it’s nice to take a break now and then to kick back and relax. The weather was good so we were able to do a lot of walking during our down time. Also, we were able to do some home maintenance things we’d been putting off. All the while, we were able to spend time with Jack and Tucker on the weekends. I especially enjoyed your extended stay in Vegas, celebrating so many birthdays together, weekends with Jack and Tucker, down time (always a treat these days), and the weeklong vaca with the boys while Suzie and Kevin enjoyed a get-a-way of their own. See you in Maine before you know it! I MARVEL AT MOTHER NATURES ARTWORK OUT IN THE DESERT, AMAZING HOW THEY CAN SURVIVE SUCH A HARSH ENVIRONMENT. 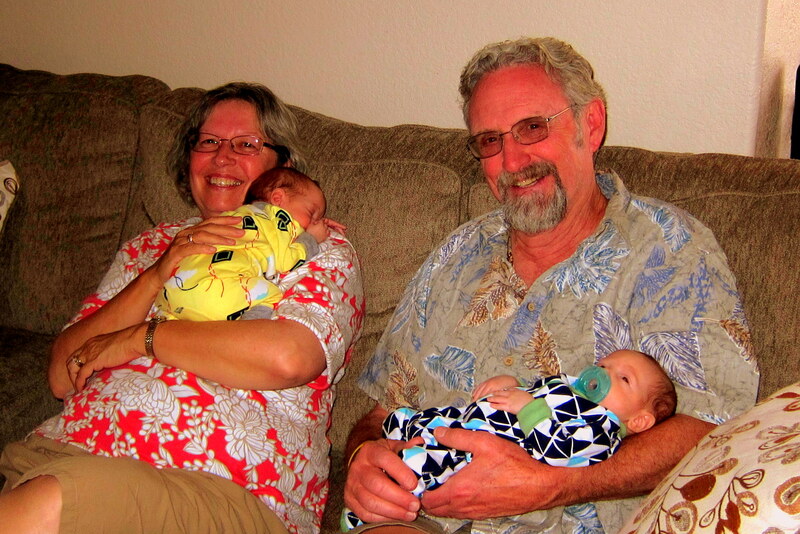 SPECIAL BONUS WITH FRIENDS AND THE GRANDKIDS, YOUZ GREAT GRAND PARENTS. WINDY AND NAN AWAY IN INDIANNA, ENJOYING THEIR GRAND CHILDREN AND WINDY IS BUILDING A TREE HOUSE. NAN INCREASED HIS INSURANCE JUST IN CASE. OUR HOME IS UPSIDE DOWN, EXTERIOR BEING PAINTED AND THE WHOLE UPSTAIRS IS FRESHLY PAINTED AND SOME NEW WALL PAPER. DRIVE SAFE AND WE LOOK FORWARD TO YOUR RETURN. So, just when are you heading home to Maine? The weather has been lovely and everything is in bloom. We had a wonderful time with your visit. Loved sharing new memories and laughing at the old ones together. Look forward to another visit next time in Vegas. Thanks, we throughly enjoyed getting reconnected with you and meeting your beautiful family. We are about a month from being home and still having a blast. Hope your time in Romania is enjoyable. See you next year when we roll through Vegas.